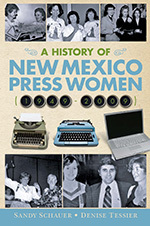 The Communicator of Achievement Award is the highest honor bestowed by New Mexico Press Women and the National Federation of Press Women upon those members who have distinguished themselves within and beyond their profession. The recipient, chosen from nominations by NMPW members, is recognized for exceptional achievement in the communications field, service to NMPW/NFPW and to the community. All nominees must be living members, in good standing for at least two years in an affiliate and NFPW (To check on a member’s status, please e-mail presswomen@aol.com.). A previous nominee can be named by an affiliate again, as long as he or she has not been honored as NFPW’s national COA winner. For specifics on building a nomination packet, rules for entry, nomination form and more, visit the relevant NFPW page. Also, there is nothing barring self-nomination. Email nomination packets to NMPW CoA Chair Diana Sandoval-Tapia at dmcsandoval@gmail.com. All nomination packets must be received by Friday, March 23, 2018. The COA Award winner will be announced at the NMPW Award Banquet on during the 2018 Communications Conference in Santa Fe, New Mexico. The winner represents our state in the national competition with the national COA and the runner-up announced at the Communicator of Achievement Award Banquet at NFPW’s annual conference in the fall. Each nominee is featured in NFPW’s AGENDA newsletter prior to the conference and spotlighted at the awards banquet. The 2018 NFPW conference is on September 6-8, 2018, in Bethlehem, Pennsylvania. For more information visit the NFPW conference web page. Those with an asterisk were named the national Communicator of Achievement.